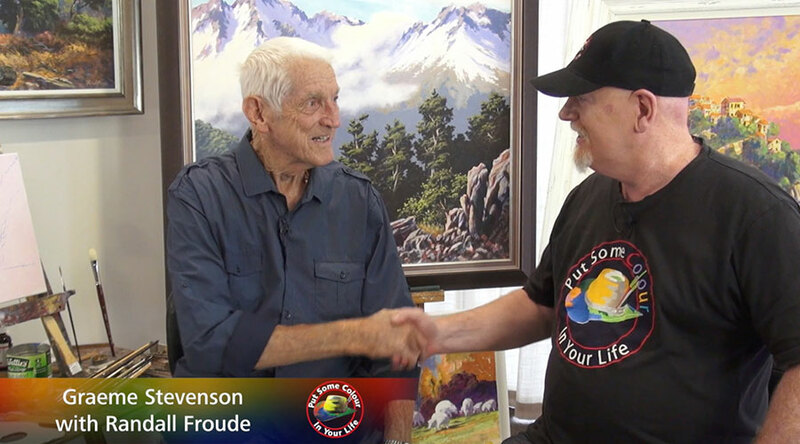 Randall Froude is an artist, tutor, and guest speaker. He is one of New Zealand’s most accomplished and successful artists with a career that has spanned over 70 years. His art has been exhibited in public and private collections throughout the world, and has painted in 13 different countries. Randall Froude was invited to exhibit at the Royal Academy in London and has been commissioned by Royal Albert China. He has performed TV interviews and demonstrations as well as being an art tutor to thousand of students. Originally trained at Elam, New Zealand’s leading fine arts college, just after the Second World War, Randall Froude spent his early working years in advertising and marketing design, but soon felt stifled by the commercial world. He started painting and achieved almost immediate success. Not only did his work reveal dramatic talent, but his commercial background had give him an entrepreneurial flair. Randall Froude is a multi-faceted artist who handles with elegance and assurance a wide range of techniques, medium, style and subject. Such international acclaim has also generated over $11 million in sales of Randall Froude originals and prints through out the world.